Donald Kraybill, Karen Johnson-Weiner and Steven Nolt have written a new comprehensive book on the Amish, simply entitled The Amish. You probably recognize the authors’ names from numerous books including The Riddle of Amish Culture, New York Amish, A History of the Amish, and many more. Over 500 pages in length, this new collaboration covers the Amish from just about every angle, from history and religious practices to gender, health, diversity, media, education and much more. I had a chance to read The Amish some time ago when it was in manuscript form and learned a lot from it. What I really liked was the span of information covering Amish from across different areas of North America. Writing about “the Amish” can be a challenge especially considering how wide-ranging the Amish can be in their practice and custom. The authors handle this adeptly, including ample examples from numerous states and communities to flesh out points made in the book. Given its wide scope and up-to-date information there really isn’t a book like this on the Amish today. I would place it among a handful of Amish must-reads. One highlight I’ll mention here is a chapter on Amish diversity which compiles a listing of the many Amish affiliations across North America, and which I don’t think has ever been done before. For me this is worth the price of admission alone. Below you’ll find the first part of a Q-and-A with the authors. Some of these are general questions on Amish life, and some are specific to the authors’ experience with the Amish and writing the book. The second part, which we’ll post in a week, will focus more on general questions on Amish life and culture. 1) Leave a comment on this post for one entry. 2) Share this contest via your social channels (Facebook, Twitter,etc) or website. Let me know you did by emailing amishamerica@gmail.com. That will get you a bonus entry. We’ll draw and post the winners in one week, on Thursday May 30th, along with the second part of the Q-and-A. Donald Kraybill, Karen Johnson-Weiner, Steven Nolt: Mainstream Americans are fascinated by the Amish—and so are we. But despite the rise of Amish-themed tourism, television shows, and romance novels, there is surprisingly little authoritative information available about them. Although there are books about the Amish in specific locations or particular practices, there was no book that provided a comprehensive picture of the enormous diversity of Amish life. There are more than forty types of Amish in 460 communities across North America. We’ve spent more than a quarter century getting to know these people, and wanted to share the remarkable diversity and resilience we’ve found. What do you think would most surprise the average American about Amish life/culture? Their friendliness and humor when you learn to know them. How satisfied they are even without the latest household conveniences and online technology. Also, people would be surprised by their creativity and inventiveness when it comes to technology. They’re not dour folks left over from the 19th century. What are three things you learned about the Amish researching and writing this book that you didn’t know beforehand? Well, first of all, the astonishing diversity of Amish life across North America is amazing. We knew it was diverse but as we gathered information from many sources we discovered forty different distinctive groups and many of them have a variety of subgroups. Church regulations are determined by local congregations and with over 2000 of them in the US it really means they’re more than 2000 different ways of being Amish. Second, we were surprised by the number of Amish publications. Over the last twenty years Amish writing and publishing has flourished. There are some fifty different Amish-produced-for-Amish related magazines, newsletters, correspondence papers such as The Budget, not to mention all the books, family histories and directories that are produced by Amish people. Third, we often say that Amish people are grounded in stable local communities, and for the most part they are, however the amount of migration and mobility which we were able to track with historical records since the mid-1960s tell a story of a lot of movement within states as well as between states. What does the Amish population look like today? The Amish are growing rapidly. Their population doubles about every 20 years, and today they number more than 275,000. So they are thriving even in the midst of a hypermodern, high-tech society. Most of their growth comes from their own children. On average 85-95% of their children join the church as young adults. Outsiders who have no family connections to the group are able to join if they accept Amish beliefs and agree to live within the bounds of the Amish lifestyle. Although several dozen outsiders are currently members, it is rare for outsiders to join. Why do you think the Amish have become the darlings of reality TV? For starters, the Amish are interesting because they appear so different from the rest of us. Outsiders have trouble imagining that anyone would be satisfied living without a car, a smart phone, or a high school education. So Amish-themed reality TV sets up lives that are radically different and “Amish” characters who then rebel against Amish ways of life, smashing our stereotypes of quiet, reclusive, rural pacifists. How do three people write one book on such a broad subject? The good news here is that the three of us are still friends! It is indeed a challenge for three people to write a twenty-two chapter book with a consistent voice and tone throughout. We like to think we’ve accomplished that but of course readers will have the final verdict. One of us would draft a chapter on a topic in which we had special interest or expertise, but then the draft was revised, revised, and revised by all of us. Most of, if not all of the chapters went through at least ten revisions. In addition we had a developmental editor, and an in-house editor offering suggestions and raising questions which really helped to improve the clarity and style of the text. One of the more interesting “discussions” at the page proof stage focused on the use of commas. With three authors and three editors (two copy editors and a managing editor) we had six different views on the appropriate use of commas! Having three authors with different areas of expertise certainly produced a much more accurate and comprehensive book than any one of us could have written alone. Trust and mutual respect was key. We had worked together in various projects prior to the book and so we knew each other, trusted and respected each other, and that was really critical to an effective writing partnership. We could argue and debate without losing respect and confidence in each other. What do you hope readers will take away from reading The Amish? The fact that Amish society has enormous diversity and complexity and is not simple or simplistic. The Amish are a robust and ingenious American group that has creatively developed ways to negotiate with the outside world to both maintain their traditions and tap many benefits of modern life. I would thoroughly enjoy reading these books! Please enter me in the giveaway. I love all the books by these authors. Thanks for the chance to win! Please enter me into the drawing. Thank you! 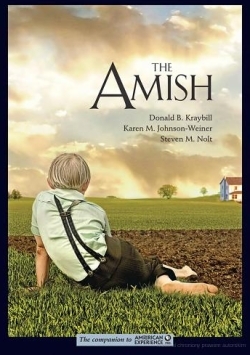 Book Away ~ "The Amish"
The question & answer “session” above is very interesting. I believe the Amish have just as many struggles & joys as the rest of us & have adapted their way of life to live as they believe God instructs them to do. I would enjoy very much getting to really know more about them. I look forward to reading the book! Sure would be great to be a winner! Thanks for the opportunity to enter the contest. I have read several books by Donald Kraybill, I would LOVE to read this book. I LOVE the Amish and their lifestyle. I would love to win a copy to read. Thanks for the chance! Have not read the authors works but in the 90’s we did subecribe to The Budget and learned a lot. It is the authors comment on the diversity amongst the Amish that intrigues me a lot. Would love to read the books.Will share the link to this piece with friends on Twitter. We are a less is more lifstyle bunch. I would love to red this books! Please enter me in the drawing!! Thanks!! Just got back from Lancaster today !!! !A two day visit from Long Island. Always have a keen interest in Amish. From my annual visits through the years, I have made some friendships !!! I have some interesting stories !!! Love conversing with them and would enjoy your upcoming books !I thoughtI had your book on the shelf, but no, it isAn Amish Paradox.I read fiction,Beverly Lewis and Non fiction about them. Iam mostly a non fiction reader but I enjoy Beverly lewis .So , hope i win !!!! I hope all the Americans that visits Amish America are having a beautiful long weekend. Victoria Day was nice last weekend here in Canada. Thanks Shom. We probably aren’t as up to speed on Victoria Day as Canadians are on Memorial Day. Looks like it is an informal start to summer for you as well. Amish fiction is the best! I love reading the Amish fiction books, most of the time the authors have researched well and the books portray their way of life well! Keep ’em coming! This book would be Amish non-fiction. I would be thrilled to win a copy of this book. If not, I’m going to have to go and buy it. What an excellent resource! It is amazing that the Amish retain 85-95% of their people. I think Evangelicals would do about 20%… I would love to have the book! I definitely would like to enter the contest! Thanks! Either way, I look forward to reading this book! The Amish world is so diverse. A book like this will give the latest update on the culture. So many people have a fixed idea of what is Amish and what is not, it will be nice for them to understand that something in a manuscript that they think is “cut and pasted from Wikipedia” is actually Amish fact. Finally! A book that really gets down to the “nitty-gritty” on the realities of the Amish. I would love to add this to my collection!!!! Please enter me in the drawing. I am interested in the diversity of the various Amish settlements. Wow! This is a big book. I would really love to read this one. I enjoy reading about the Amish. Thank you for the chance. Love to read Amish books. Would love to win these three books. I am a amish book junkie! Love reading about the Amish! Would love the opportunity to win these awesome books. Not a day goes by that I am not reading books about the Amish, romance, fiction, non fiction, websites. Like Cheryl, I too am a amish book junkie! Thank you for the opportunity to enter the giveaway for this desirable book. I would love very much to win this book! I love reading Amish stories and I already own a large collection of amish books! It would be a real pleasure to win this book. Will have to check the library and hope they will carry it. Thank you for the opportunity to win a copy. I would so much love to read this book to see how it compares to how I was raised Menninote. Please enter me in this contest. Please enter me in the 3-book giveaway. This is my first time to your time and I have thoroughly enjoyed it. continued success. I would love to read these! Thanks so much ! Non-Amish are so enthralled with the Amish, I wonder if the Amish are just as enthralled with the non-Amish. Are the Amish as interested with the Englishers as we are with them? I would be thrilled to win “THE AMISH” book giveaway contest. I seem to read anything i can get my hands on with respect to the various Plain Communities, be it fiction or nonfiction. In the past year or so however, with more and more fiction writers putting their books on the market i think a lot of incorrect info is floating about and reading books buy such knowledgable authors as Nolten, Kraybill and Johnson- Weiner, can help correct many minunderstandings about the Plain folk. Erik, Looking forward to reading this as it will support the PhD and I was expecting to be at the conference, but have had to pull out for health reasons. I think my poster will be displayed there anyway. Sorry to have missed it. I’m sorry to hear you won’t be there Fran. I’ll look for your poster and I do hope things improve health-wise. Where can I find a list of Amish books? Thanks for having the contest. The above contest was actually from last March, but the book is a strong recommendation. I became interested in the Amish after reading a couple of fiction books about them. I once bought a book about “bundling” among the Amish, but I have never seen any reference to the practice in any other information I have read. Is bundling practiced among young Amish today? I am trying to learn as much as I can about the Amish from amishamerica.com because I want to learn facts not fiction. I would like a list of recommendation from you, and a list of sources where I can buy them. Thank you. I would love to win a copy of the books in the contest. I love reading about the Amish. I have read a lot of amish fiction. I would like to improve my knowledge of the real amish! So many different religions in the world and I would like to learn the best of as many as I can. I studied comparative religions in college and I feel like a sponge waiting to sop up more. Thanks.